The One Step Checkout extension for Magento 2 provides your shoppers with 2 options to log in or sign up for a new account right on an optimized checkout page. Indeed, your shoppers can choose to use default login or social login. Visitors can log in immediately in the checkout page. When they click on the Login/signup button, the pop-up box will appear for your shoppers to let them login without redirecting to another page. Besides, if the visitors do not have an account, they can easily register by filling the form. There also has the Forgot password option to assist your visitors in case they cannot remember their password. Store admin can integrate the Social Login extension for Magento 2 to enable the shoppers to log in by using their social account. After the installation is done, the Login option in the checkout page will be changed into the Social Login form. According to WebHostingBuzz research, 86% of people said they are bothered by having to create new accounts. That means you might lose up to 86% of shoppers who are already interested in subscribing your stores. I bet that you absolutely don’t like it. By using Social Login with just 1 click, the shoppers can immediately have a new account based on their social profile. This surprising convenience will help your stores to attach more and more customers. Even when you don’t mind losing the opportunity to turn 86% of interested shoppers to become your potential customers. However, do you know that according to a research compiled by Blue, 88% of users admit to entering incomplete or incorrect data on Registration Form? When shoppers sign up via their social account, your stores can access their social profiles includes lots of useful information such as gender, age or interests. The benefits of collecting customer data are vast. Not only you can improve the buyer’s personalized shopping experience but also learn from the past mistake to make your store better. However, without Social Login, your trusted data is almost nothing in the end. People already have multiple login credentials to remember and it will be harder for them to have a new one. With Social Login, the shoppers just need to remember which social network they used to sign up and that’s enough. As a result, less to remember, less failed logins and less password resetting. Besides, Social Login works base on your social account which makes it’s hard for an unsuccessful login to occur. Social Login is absolutely an effective marketing module for your store. When shoppers already have a social account and they love your store, they possibly post messages to their Social Network about it. Hence, you can access a wider range of visitors and increase your store’s traffic. Moreover, word-of-mouth recommendation is one of the best ways to effect the shopper’s decision and your store will become more and more successful. In conclusion, from now on, your shoppers can Register, Login, and Signup by using their social media profiles. 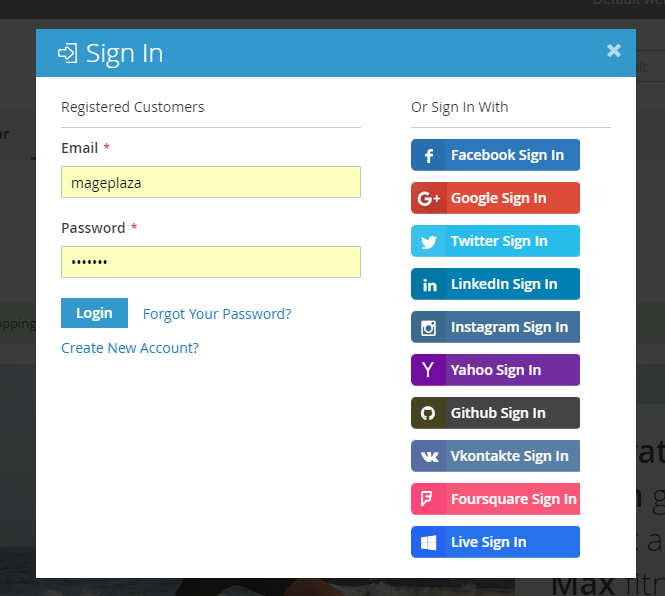 Mageplaza Social Login extension for Magento 2 supports 11 different social login types. Moreover, the Social Login module for Magento 2 also allows your visitors to signup by using default login form if they do not have social network accounts. To download the FREE Magento 2 Social Login extension, go to here. 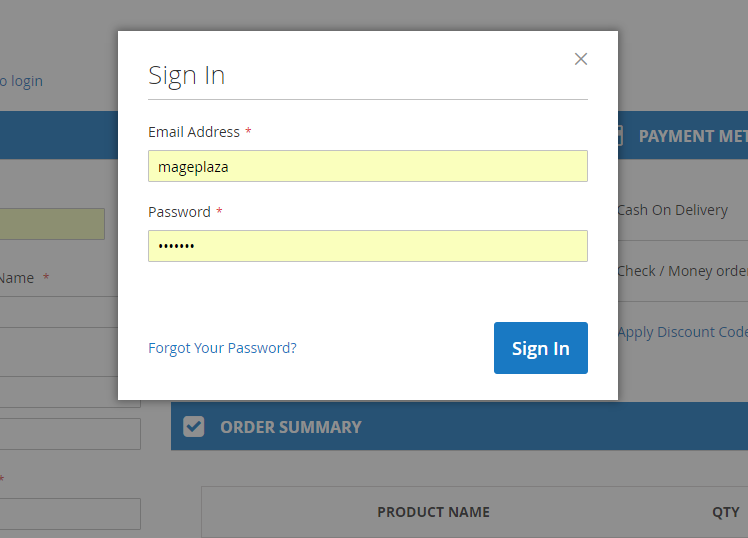 Along with this convenient quick login feature, Mageplaza One Step Checkout also provides many others with an effort to optimize your shopping experience and your conversion rates. Your customers now do not have to quit the checkout page to log in or register. Neither do they exit to go through Terms and Conditions.